If you want more than just sun and the beach, then consider a trip to Salt Lake City. Our city is full of unique and wonderful attractions. You can go on a scenic drive through Big Cottonwood Canyon, explore Temple Square, check out the zoo, or get a little outside of town to do some snow skiing near Park City, UT. And let’s not forget about the lake itself! There’s definitely something for you here. The sand and surf have their perks, but if you’re more of a city dweller, then come to SLC. Sure, we may not be the biggest city around, but you can enjoy a wide range of attractions, entertainment, great food, and all that this city has to offer. And if you need a day or two in the great outdoors, we have plenty of outdoor recreational opportunities just a short drive away—hiking, fishing, skiing, watersports, and more. 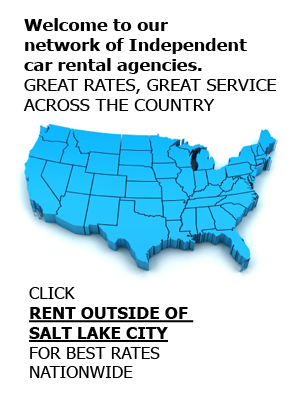 As you plan your trip to Salt Lake City, don’t forget to rely on us for an affordable car rental. Our budget-friendly rental options include cars, minivans, passenger vans, and much more. To get a free rental quote or to make a reservation, contact our team at Affordable Rent-A-Car today at (801) 266-7368, or book online at your convenience.